After sending the matter back to the judges, the “questions that were raised” about the 2017 audio/multimedia Eclipse-winning work, Barbara Livingston’s “Chasing Man o’ War’s Ghost,” published on Daily Racing Form, were deemed not to warrant a disqualification. The Eclipse Awards steering committee released a statement on Sunday that this year’s award results would stand. Steering Committee members representing the National Turf Writers and Broadcasters (NTWAB) and National Thoroughbred Racing Association (NTRA) — DRF representatives on the Steering Committee recused themselves — determined that the question merited contacting the judges in the Audio Multi-Media and Internet category who had awarded points to the entry to determine if this new information would cause them to change their votes. The judges replied that the new information would not have impacted the way they voted or changed the order in which they voted. Thus, there will be no change involving the winning entry in this Audio Multi-Media and Internet Category. 1) By their own description of the review process, the Eclipse Awards steering committee largely dodged the eligibility question regarding the winning entry. The 2017 Livingston multimedia work contained almost the entirety of a 2010 Man o’ War blog post written by Livingston, also published on DRF, and there was no notice on the 2017 piece of the 2010 text’s inclusion. The decision about how to handle the situation was handed over the judges (the judges who had initially given the Livingston entry points, that is, not the full panel). 2) And yet, the statement does acknowledge: “The entry, taken as a whole, was published for the first time between those dates. Portions of the entry were not, as pointed out in the questions that were raised.” In recognizing that portions of the work were not published in 2017, the year covered by the award, and stating that the inclusion of an original video is what qualified the entry for the audio/multimedia category, the steering committee has staked out an untenable position: Previously published work that includes a new video is eligible for the award. The entry does not have to be wholly original. This is bad precedent, and I don’t see how the rules for this category don’t get altered to prevent future entries taking advantage of such a loophole. 3) In the meantime, how was the judging process then fair to the other people and organizations who entered work in the audio/multimedia category? If I were one of the entrants (and I’m not/wasn’t), I would feel demoralized and alienated by this decision to allow unattributed previously published material in the winning entry. It’s a slap in the face to others who followed the spirit — and the apparent meaning — of the award rules. 4) Incidentally, the situation points up the ongoing folly that is combining audio and multimedia into one Eclipse award category. The award rests on multimedia containing an audio element. Video is allowed to fulfill the audio requirement, which means that video then becomes synonymous with multimedia. This is such a barren view of digital possibilities. If the multimedia award is going to be for a video, then better to group audio and video into one category and create a new, standalone multimedia category that allows for any combination of media. Think of the potential! Data viz + audio. Video + social storytelling + text. It could spur some fresh work. 5) Finally, I’ll add that I’m disappointed DRF and Livingston did not acknowledge the questions, or the appearance of an ethical issue, or explain the editorial policy that may have allowed what appears to have happened. It does not look high-minded to have remained quiet. It looks arrogant. 12:50 PM: This post has been edited to include a response from DRF regarding the 2010 Man o’ War piece. 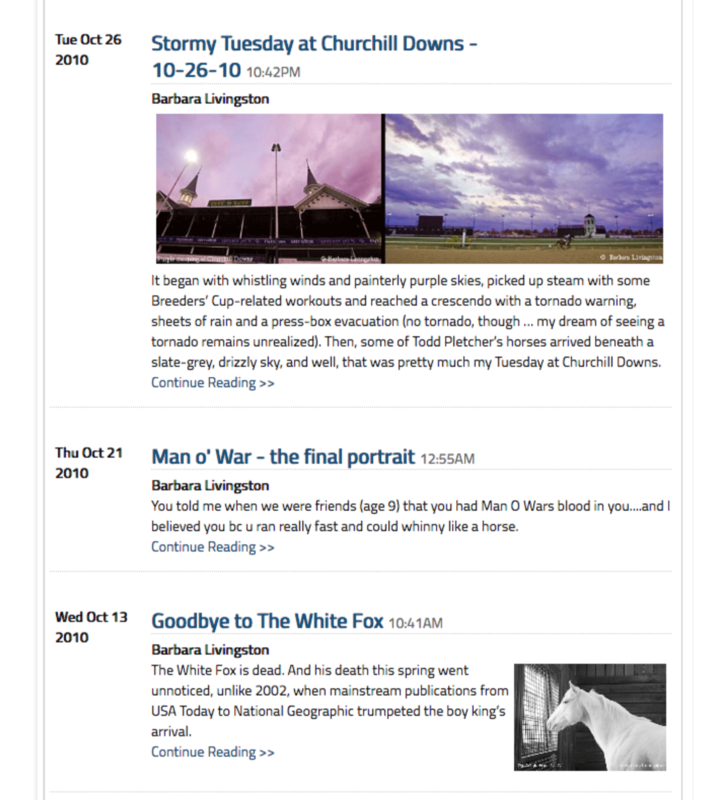 It has been four days since it was announced the Daily Racing Form won a 2017 Eclipse Multimedia Award for a piece primarily created by photographer Barbara Livingston, and four days since I pointed out the apparent reuse of a 2010 blog post about Man o’ War by Livingston in the 2017 multimedia piece. In that time, the DRF has made no comment about the award situation. The Eclipse Awards steering committee is discussing the matter. A sidebar to the question of the recycled text is the related question of what happened to the 2010 post. It was originally published on October 21, 2010, and the live page was captured by the Internet Archive on December 29, 2015. There is some uncertainty about its accessibility from that time to January 3 of this year — the original URL returned an “Unauthorized” message when I attempted to view it on January 3. The Internet Archive captured an “Access Denied” version of the page on October 2, 2017. I retrieved a version of the post on January 3 from what appeared to be a DRF subdomain page, at this URL, for the purpose of comparing the 2010 and 2017 texts. On January 4, and possibly the evening of January 3, the 2010 post was appearing once again at its original URL. 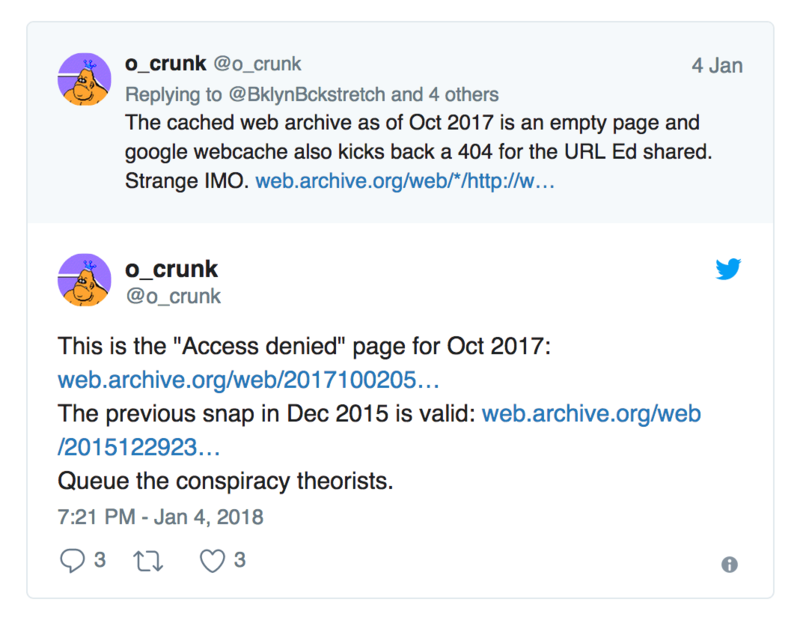 Odd, but there are numerous reasons a URL might seem to be go missing on the web — Google and Internet Archive take irregular snapshots — and the possible range of time the page may have been inaccessible could not be pinned down using either service. On Saturday, I received two screenshots taken in March 2017. I have examined the EXIF data of the original files and believe both to be unaltered and to have been created on the dates and times I was given. The images below have been cropped and saved by me to remove potentially identifying information. The 2017 multimedia piece was published on DRF on March 24, 2017. I want to caution — there are many technical and production-related reasons why the 2010 Man o’ War post may have been inaccessible for a time. DRF underwent a major redesign in 2013. All of the DRF blogs were unavailable on the site for a lengthy period. 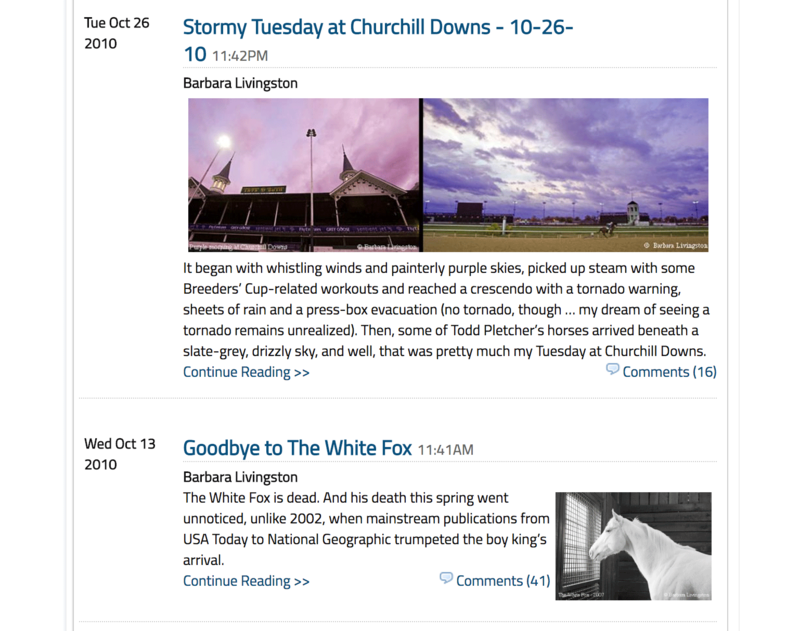 DRF has made several changes to its paywall, including dropping it before the Breeders’ Cup, which could have affected the accessibility of pages, as well as made updates to other backend systems. Whatever may have happened, it’s an unfortunate coincidence in light of the 2017 multimedia piece winning an Eclipse award. DRF’s editorial team looked into it and can’t determine how it became unpublished. We believe it possibly happened inadvertently during some backend changes to the site. We didn’t intend to unpublish the original blog and republished it after it was brought to our attention. DRF does not typically remove old editorial content from its site. The reply is appreciated — without addressing the question, the post’s apparent unpublishing/republishing was feeding a shady perception. Pedigree expert Sid Fernando has a deep memory and a willingness to publicly recall past, less-than-wonderful, episodes in recent racing history, qualities that make him a good source for adding context to current, less-than-wonderful, episodes in racing. Late last night, Fernando was bringing some perspective to the questions about Barbara Livingston’s 2017 Eclipse award for a multimedia piece that reused copy from a 2010 blog post by referring to the controversy over Eclipse media award rules after author Laura Hillenbrand won a 2001 Eclipse award for an excerpt from her book “Seabiscuit” that was published in Equus magazine. I quit the National Turf Writers Association after the 2001 media Eclipse Awards were announced and then-NTWA president Jay Privman of the Daily Racing Form unfairly, in my opinion, questioned the eligibility of a piece written by one of the winners, Laura Hillenbrand. Hillenbrand, author of the best-selling book “Seabiscuit: An American Legend,” had previously won an Eclipse Award in 1998 for an article on Seabiscuit published in American Heritage magazine. Her 2001 award was for an original adaptation from the Seabiscuit book that appeared in Equus magazine. As I recall, Privman, as NTWA president, sent an email to members criticizing the awarding of a second Eclipse to Hillenbrand and suggesting it was “unseemly” of her to even submit the piece for consideration. It was my understanding he was trying to have her stripped of the award. What is to stop a book author from submitting one chapter from a book to a magazine, year after year, in an attempt to win an Eclipse Award for each chapter? Based on this precedent, it could be done. Similarly, if Livingston’s reuse of the 2010 copy is allowed to stand, what’s to stop someone from repurposing previously published material into a “new” multimedia piece and submitting it for an Eclipse? The current rules do not address reuse. Privman said in 2001 that the loophole for book excerpts would be tightened. Will the same be done this year for incorporating previously published content into multimedia work submitted for Eclipse consideration? More disturbing, however, is this: the NTRA, in its press release, said the winning magazine submission was an “original adaptation” commissioned for Equus. Fine. But what it really amounts to is reconstituted matter from the book. It’s almost verbatim, yet abbreviated in some areas. In the case of Livingston, we have an analogous situation — a significant portion of the text in the 2017 piece is verbatim copy from the 2010 post. 3) Privman also addresses a comment left by Vic Stauffer on the Paulick Report about the 2003 audio/multimedia award. Stauffer shared the Eclipse award that year with WBAL Radio in Baltimore, after he was initially awarded the Eclipse for his KSPN ESPN Radio 710 story, “56th Birthday Tribute to Laffit Pincay Jr.” Concerns were raised about factual errors in the story, leading the Eclipse Awards steering committee to reopen the category for voting. “The organizations must be fair to all who submit awards,” wrote Privman, about how the factual issues with Stauffer’s radio story compromised other entrants in the category. Does not the same standard apply to Livingston’s entry and this year’s audio/multimedia category? Is it fair to other entrants that the winning work was not wholly original? I say no. And while it might be unfair to single out DRF and Livingston in this year’s situation, I would argue that DRF has a greater obligation to appear to play fair because DRF is one of the Eclipse Award voting blocs and a sponsor of the Eclipse Awards program. When made aware that Mr. Stauffer’s Laffit Pincay feature had been judged No. 1 in the radio category but contained such a fundamental error, Mike [Kane] and I felt strongly that the situation mandated discussion with the other Eclipse committee members. The committee agreed that the judges deserved to be informed of the error, and let them re-vote according to their personal standards and conscience. An even earlier Eclipse scandal yields a clue into how flawed winners have been dealt with in the past. In 1996, Stephanie Diaz won two Eclipse Awards for magazine and newspaper writing. She was then charged with fabrication and plagiarism. An investigation led to Diaz being stripped of her magazine award. Fabrication and plagiarism are much graver charges than reusing your own copy without attribution, of course (and just to be clear, I am not equating the two situations), but it’s interesting how the Eclipse organizations choose to investigate and settle the matter then — with an arbitrator. Will there be a similar public reckoning over Livingston’s award? You told me when we were friends (age 9) that you had Man O Wars blood in you … and I believed you bc u ran really fast and could whinny like a horse. You told me when we were friends (age 9) that you had Man O Wars blood in you….and I believed you bc u ran really fast and could whinny like a horse. The similarities did not end with that one little note. For me, there is one Big Red and he was born a hundred years ago, on March 29, 1917. If others of the same nickname preceded him, they were simply opening acts. Anyone since? Call them Big Red all you want, but, to me, they are imposters. From there, a comparison of both posts reveals that almost all of the 2010 post has been repurposed, with some rearranging, into the 2017 piece. You can view highlighted screenshots of the 2010 post and the 2017 version. Note: The 2017 screenshot is cropped to only highlight the text copied from the 2010 post, it is not the full text of the 2017 story. To view the full text of both posts on DRF, click/tap this link for 2010 and this link for 2017. Reusing or republishing content is not unheard of in media — pieces written for one outlet may get republished in another. A publication might republish an older work made freshly relevant, or a writer may return to an older work to expand or revise it. In most instances, when this happens, the work is accompanied by a note that indicates that it was originally published elsewhere, previously published on a certain date, or that it has been revised. This is attribution, and it’s a practice that avoids the appearance of an ethical issue — deceiving your audience about the provenance of a work. There is no such attribution on the 2017 Man o’ War piece regarding the use of 2010 copy, nor is there a link to the 2010 post, either of which would have covered DRF and Livingston against the charge of what seems to have happened here — Livingston reused her 2010 post as the basis of the 2017 multimedia piece, which has now won an Eclipse Award. We have reached out for input from Daily Racing Form, which submitted the entry for Eclipse consideration, and will be discussing the situation with the Eclipse Awards Steering Committee today. I’ll update this post when there’s a resolution to the discussion. 1/8/18: After consideration, no change. The rules against all manner of journalistic recycling, from sloppy attribution, to self-plagiarism, to plagiarism, are part of the basic dos-and-don’ts of the craft. Lehrer’s many fans deserve an explanation, and hopefully they’ll get one. Livingston’s fans also deserve an explanation.